He added: “Some years ago no one was bothered about AI and now it is the key issue!” According to Müller that is how quickly times can change. Digi International raised the demo bar by highlighting the Digi XBee3 Cellular and solution demonstrations, and had the iKeg solution which involved beer. 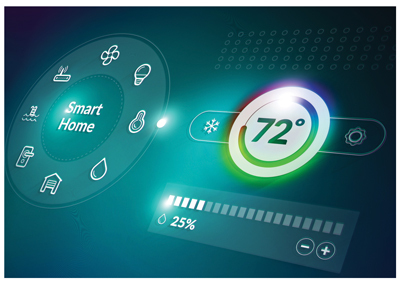 The Digi XBee3 series on show was designed to support IoT innovation and computing capability at the network edge. 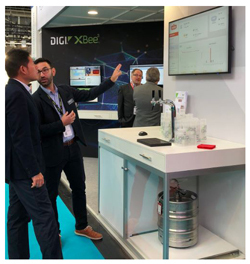 The SteadyServ iKeg demonstration showed the SteadyServ iKeg using sensors to measure keg volume, analysed the data locally with a Digi ConnectPort gateway, then sent the analysis into the cloud over a Zigbee connection. The iKeg application presented the cloud-based information to bar managers to help increase inventory accuracy and proactively order more beer when stock runs low.t wasn’t just AI that was a key theme at electronica this year, naturally EVs and autonomous vehicles were commonly spoke about amongst the automotive-based halls. Meeting with Valens Automotive I learnt all about the company’s goal to try and reduce the number of cables, with a product that combines all technologies - the HDBaseT Automotive - and it is not as big as you might think! The HDBaseT is a simple solution for in-vehicle connectivity, to address the needs of current cars but also tomorrow’s connected cars. Also known for working with cables Molex had a very large and exciting stand to attract people and to show they are expanding. They no longer want to just be known for cables and connecting. 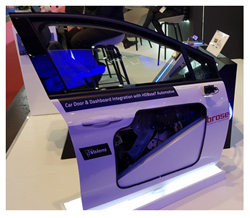 Molex was keen to show off new technologies which are designed to meet the increased demand for in-vehicle processing power. Molex appreciates and understands that top tier automotive companies constantly face new challenges with next-generation, intelligent vehicles so has branched out from just cables and now provides end-to-end Ethernet-based solutions that operate at high bandwidth across multiple hardware and software components. The RFEX connector was demonstrated live to produce cupcakes and brownies that had been made through the microwave on the stand. 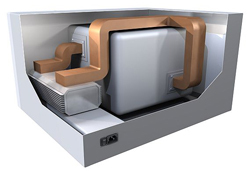 The RFEX connector is the first connector dedicated to RF-Energy. RFEX is available for integration into RF-Energy modules. Another cable company Nicomatic, also had automotive news. Although at the show the company was announcing the new all-in-one electrical troubleshooting test tool, it also explained how over the past year, Nicomatic had actually sponsored the WARR Hyperloop Team. 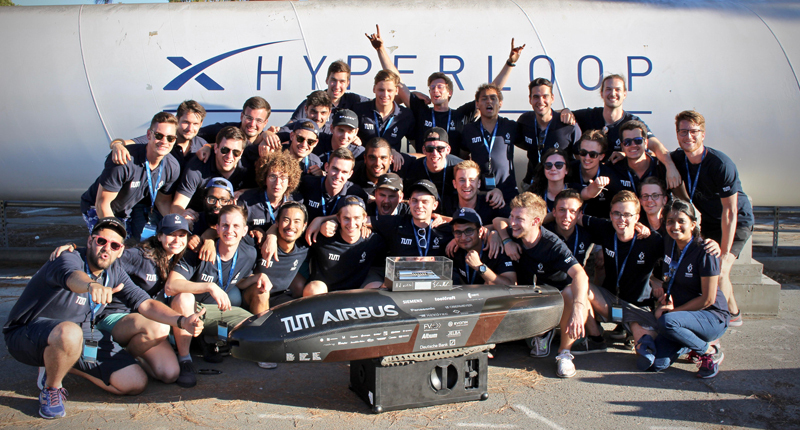 The WARR Hyperloop Team from the Technische Universität of Munich (TUM) won the 2018 SpaceX Hyperloop Pod competition by going almost 50% faster than in 2017, achieving a final speed of 467km/h. Nicomatic is the team’s only connector sponsor and Nicomatic’s micro-connectors contributed to this success by delivering reliable performance under challenging race conditions, while minimising space and weight. Bagnuoli continued by explaining the aim of the new product is to support customers not just today but to make sure they have a future-proof product from Melexis. Nano Dimensions had their latest DragonFly Pro System on show to give live demonstrations of this precise inkjet deposition printer with dedicated nano-inks and optimised 3D software, which is one of the top solutions for the additive manufacturing of electronics. There were lots of live demos taking place, and Electrolube did not let us down in this area, as they had live demonstrations of what it describes to be revolutionary, and one of a kind - its new 2K850 conformal coating material using a line-up of three machines covering: dispensing and cure, followed by an end-of-line test of the coating using new technology. BCycle, a subsidiary of Trek Bicycle, produced with Plexus a bike share system that could aid how we think about public transport. When they began the project they ran into a number of challenges and turned to Plexus for a solution, who were able to assist with designing, manufacturing and delivering BCycle’s Dash bike share system to the market, in just four months. 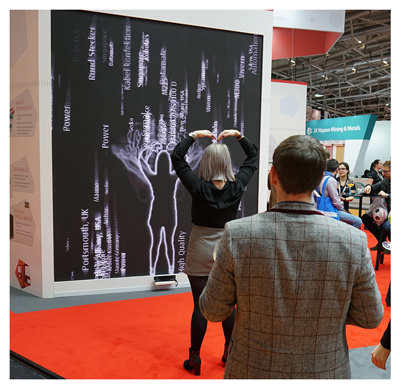 It is safe to say there was a lot of fun and games featured on some of the stands, including connector company Harwin, who brought a ‘Word Waterfall’ to its stand, to accompany its afternoon gin cocktails. Delta had a large stand with a huge number of products on show - one large area included power solutions. Solutions including high voltage power supplies, programmable power sources, EC fan cooling systems, lithium-ion battery energy storage cabinets, CellD telecom power systems and integrated power solutions that boost energy savings and optimise performance, especially for highly demanding applications that are paving the transition towards Industry 4.0 and 5G communications, were some of the key highlights from the company. Additionally Delta had a photo booth for visitors to take away a snap and remember what a great show 2018 was, and even more is that the company gave away prizes to visitors who shared their snap on social media!